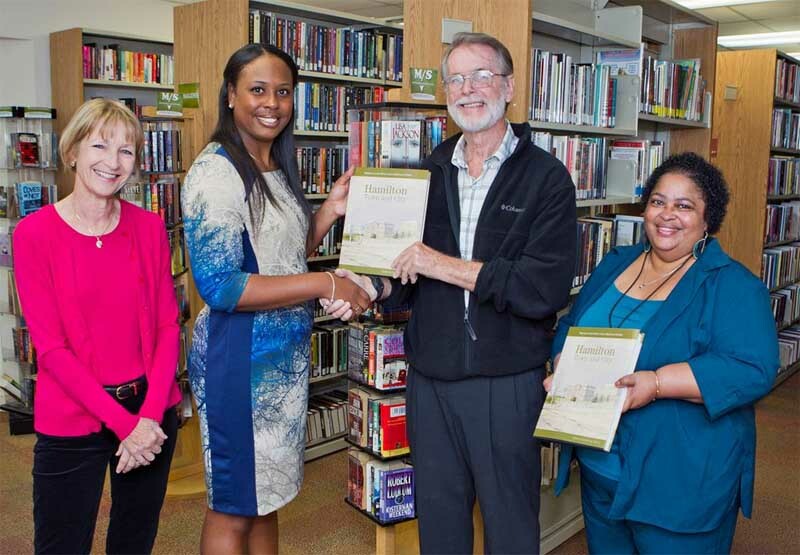 The seventh bookin the Bermuda National Trust’s Bermuda’s Architectural Heritage Series was recently gifted to the Bermuda National Library [BNL]. The book Hamilton – Town and City is a collection of stories and the history behind the buildings of the City of Hamilton. The other books in the series have been about individual parishes but this volume elates to our capital —the City of Hamilton. Hamilton – Town and City is almost a totally volunteer effort. It was designed by Dace Ground [widow of former Chief Justice Sir Richard Ground] and the final book penned by former editor of the Royal Gazette David White before his death. The book launch is just in time for the anniversary celebrations set to take place next year to commemorate the 1815 move of the seat of Government from St. George’s to Hamilton. The next book in the series will be Pembroke Parish by Dr. Clarence Maxwell.